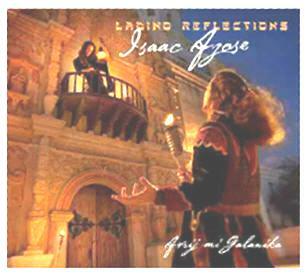 “Ladino Reflections” is a double CD set of Ladino romansas and folksongs, released by Hazzan Isaac Azose of Seattle. Tracing the Tribe met Hazzan Ike in Seattle when visiting our Jassen family. He is a beloved friend of our family and of the Sephardic community. 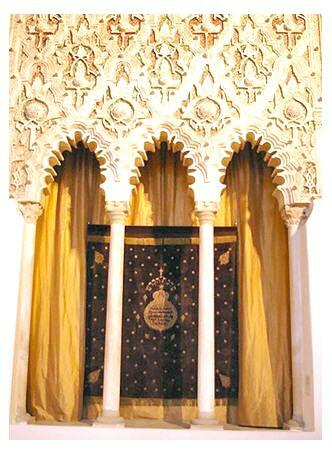 For some 40 years, he has dedicated himself to the preservation of Mediterranean Sephardic traditions. Although he retired as the hazzan of the Sephardic Congregation Ezra Bessaroth, he wrote me that he’s busier than ever with many projects on his desk. Think of the energizer bunny! “Ladino Reflections” has been 20 years in dreaming and six months in production. Hear the samples and find ordering information here. If you enjoy authentic Ladino music, this CD will make you happy. For ordering information ($28, includes $3 s&h/US orders only), click here. Readers interested in Sephardic liturgy as sung at Congregation Ezra Bessaroth, should click here, listen to the samples and order this double CD ($23, includes $3 s&h/US orders only). For international orders for the new CD or the liturgy CD, click here to contact Hazzan Azose. Look at the calendar – Pesach isn’t that far off. 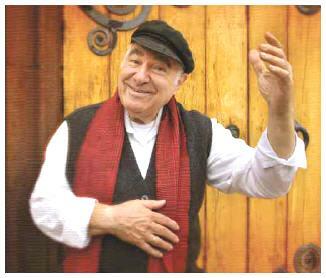 Want to learn the Sephardic melody and the Four Questions in Ladino? Click here. Those with Jewish roots in Istanbul or other Turkish geographical connections will find this resource of interest, as will Sephardic researchers of surnames in many countries. Music professor Daniel Kazez of Wittenburg University (Ohio) produced a major database of Istanbul’s Jewish community records, with the cooperation and generosity of many individuals and organizations in that community. It was online for some time until privacy complaints took it offline. There are some 100,000 Jewish records available, including more than 35,000 marriage records (Chief Rabbinate 1887-, Ashkenazi community, 1923-, Italian Congregation 1870s-), and some 30,000 burial records for the following cemeteries: Hemdat Israel 1899-, Italian burial list 1918-, Italian Şişli Cemetery 1800s-, Kuzguncuk Cemetery 1913-, Ortaköy Cemetery 1939-, Yuksekkaldirim Synagogue 1916-. Remember also that there has been an Ashkenazi community in the city (formerly Constantinople) since the 14th century, that a very large number of Spanish Jews were invited following the 1492 Expulsion, that Crimean Jews were resettled there, that a large Italian Jewish community existed and that Istanbul welcomed many European Jews prior to the Holocaust. The Istanbul Jewish community provided access to these precious records to enable translation from archaic handwriting (solitreo) and alphabets, by so many volunteers, who also typed and proofread them. Generous donors also funded the microfilming of records and converting them to digital images. Consistent with Turkish privacy laws, the database is no longer publicly searchable. However, researchers can request a records search. Write to the Istanbul Chief Rabbinate’s Office to request a search. In your email, include the following: 1) details on the person about whom you seek information (surname, given name, approximate birth year, names of parents or children) and 2) how you are related to the person about whom you seek information. Allow a week for a response. For more information on these names, check out the searchable databases at Jeff Malka’s SephardicGen and the name search engine at Harry Stein’s Sephardim.com. At Dan’s site (link above) see all the names in the database, organized by frequency of records for each name, ranging from 4,332 for Levi, down to only one instance for thousands of names. The complete list of names demonstrates the diversity of the community with names from Spain, Italy, across the Mediterranean and from Europe. Additionally, there is an alphabetical list of given names. Readers may find the spellings difficult to understand. Note that C=SH (CIPRUT=SHIPRUT), that Y=I (YSAYA=ISAYA), and other common variants, such as ABEN=BEN. Some individuals with very Hebrew surnames may have adopted more Turkish-sounding names. Do check the complete list of names at the first link above. Although Tracing the Tribe missed reporting on this conference earlier, readers should know about such events which shed light on relatively unknown Jewish communities. On November 23, the Azerbaijan Society of America (ASA) and Azerbaijani-American Council (AAC) joined the Turkish Coalition of America (TCA), the Assembly of Turkish American Associations (ATAA), the “Turk of America” magazine and the Uzbek Initiative organized a one-day symposium on “Jewish Identity in the Turkic World,” at New York’s Center for Jewish History. Note that Azerbaijan was part of Iran and that Farsi is spoken there as well as Azeri, a Turkic language. Additionally, the city of Baku was famous for its oil production in the early 20th century, and many of our ancestors from Belarus (including some of mine) and elsewhere, moved there to work in the new industry. The region is also important as many Russian Jews were evacuated to Uzbekistan and other areas at the time of WWII. Each of these Jewish communities had indigenous Sephardic components as well as Ashkenazi communities. For centuries, the Jewish peoples have lived in Azerbaijan, Turkey, Uzbekistan and other parts of the Turkic world. Tens of thousands of “Sephardi Jews” lived in present-day Turkey since 1492, when Ottoman Turks provided shelter and acceptance to the Jews escaping the Spanish Inquisition. One of the largest Azeri-speaking communities in America are the Mountain Jews. They settled in Azerbaijan over two millennia ago and tens of thousands of them continue to live in northern parts of Azerbaijan today, enjoying prosperity and acceptance. The Bukharian Jews of Uzbekistan thrived in this region for 2500 years in an atmosphere of tolerance and mutual respect. The program included speakers representing the Jewish communities of Azerbaijan, Turkey and Uzbekistan. “Desperate Hours,” Screening and Talk on the role Turkish diplomats played in saving thousands of Jews during the Holocaust. Habib and Blackstone spoke about their life experiences. Paintings by Stass Shpanin were displayed along with the copies of historical documents from the Ottoman Archives which illustrated Ottoman-Jewish historical relations. The conference was also co-sponsored by the International Charity Fund of Mountain Jews (STMEGI), the Turkish-American Chamber of Commerce and Industry (TACCI), the Bukharian Jewish Community of the US and Canada, the Turkish American Action Committee and “Kavkaz” Jewish Youth Center. The new issue of ETSI, the Sephardi Genealogical and Historical Review is now out. — In “An unfulfilled dream – The saga of Anusim families.” Raphael Benghiat traces the history of the previous owners of Montfavier castle in the Gironde, France. It likely belonged to Jews of the Bordeaux and Bayonne area, where many New Christians (Conversos, Anousim) settled. — Laurence Abensur-Hazan explores the 1841 fire which partially destroyed Smyrna, Turkey. The Jewish residents were the ones most affected by this catastrophe. — There’s also a book review of the recently published “Tanger, entre Orient et Occident.” The Jews of Tangier (Morocco) were never required to live in a specific geographic area. The book details many aspects of this community, such as Jewish businesses, the city’s first Freemason society, and provides information on the Fuente Nueva quarter where many Jews lived. The purpose of “Etsi” is to help people interested in Jewish Genealogical and Historical Research in the Sephardi World. “Etsi”‘s field of study covers the Ottoman Empire (Turkey, Greece, Palestine, Syria, Libya, Egypt…), North Africa (Algeria, Morocco, Tunisia), Spain, Portugal, Italy and Gibraltar. The study of every Sephardi community or family who lived in other regions is equally within the society’s aim. The objective of the founders is to create an international exchange forum for genealogists and historians interested in research into the Sephardi world. “Etsi” supports and encourages all research work on Sephardi Genealogy and History, especially archives records, cemeteries records, ketubbot (Jewish marriage contracts) and circumcisions registers inventories. To obtain this issue or back issues of ETSI, contact Philip Abensur in Paris, France. Tablet Magazine has a story by Robin Cembalest on a Ladino newspaper in Turkey that is seeing a revival. At the bottom of this post, also see Tracing the Tribe’s note about “Mountain Spanish” still spoken in northern New Mexico (and elsewhere) by the descendants of the old families who arrived at the end of the 16th century. Read A New Dawn here. Ladino or Judeo-Spanish was brought to Turkey post-1492 Expulsion by the Jewish refugees from Spain. For Tracing the Tribe’s Ashkenazi readers, think of it as the Sephardic equivalent of Yiddish. Both Jewish languages created literature, poetry, music and other hallmarks of history and culture. When Sephardim arrived in New York in the early 20th century, many Ashkenazi Jews didn’t believe they were Jewish because they didn’t speak Yiddish – they never knew that Ladino was a major hallmark throughout Jewish history. Ladino nearly died as a result of numerous factors. Ladino-speakers and Yiddish-speakers alike were decimated by the Holocaust as just one reason. The editor noted that in the 1970s, it was expected that Ladino would have disappeared in 10-15 years. In the 1980s, Turkey allowed freedom on traveling abroad, and its Jewish population realized that with Ladino they could communicate in Spanish-speaking countries. The 500th anniversary of the Expulsion brought Sephardic scholars to Turkey, and raised awareness of Ladino – and acceptability – to the community. The research center opened in December 2003, to research, archive, and transmit the language, music, and history of Turkish Jewry, a difficult task because very little was written down. Another problem was that Ladino switched from the Hebrew Rashi alphabet (called solitreo) to the Latin alphabet in the 1920s. Only a handful of people can still read the old alphabet, which makes genealogical research difficult in Turkey, as the records were written in solitreo. 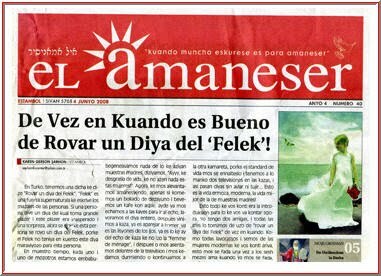 Today’s El Amaneser was founded in 2005. Ladino publishing began in 1842 with Izmir’s La buena esperansa. During the period between WWI and WWII, more than 300 Ladino periodicals were published in Turkey and the Balkans. In the 1920s, some 85% of Turkish Jews said Ladino was their mother tongue, although even then, the article states, it was dying. It was supplanted by Western Europe’s language of culture French and then by Turkish in 1923. The new government promoted Turkish and suppressed Kurdish. Ladino was not suppressed, but according to scholars, the community itself helped to suppress it. In Eastern Europe, where scholars were promoting Yiddish literature and education, Turkish Jews felt Ladino was backward and didn’t transmit it down the line. Says Gerson Sarhon, because the Jews were notorious for speaking Turkish with horrible accents, they thought they should give up Ladino and assimilate with Turkish. In this century, at a time when Yiddish continues to be used as the primary language in chasidic households around the globe, Ladino has “lost its function in the home,” said Gerson Sarhon, who wrote two master’s theses—in social psychology and applied linguistics—on Judeo-Spanish. Jews today who are 50-70 years old, learned Ladino from their fluent parents who spoke it at home. Those who are younger may have learned it from their grandparents or not at all. Gerson Sarhon is heading an effort to record the vanishing generation of native speakers and post sound files to the Internet as part of a study to analyze vocabulary and accent. As a lead singer in the Los Pasharos Sefardis musical group, she also documents Turkish Jewry’s musical traditions. The center has already published a new book on Turkish synagogues, although it focuses on publishing the monthly El Amaneser and the Salom weekly (in Ladino until 1983’s switch to Turkish). Salom also prints a monthly Ladino supplement with some 4,000 subscribers. Amaneser goes to readers in Turkey, and also to Spain, China, Latin America and the Philippines. While Salom publishes hard news—mostly stories from the Diaspora that don’t necessarily make it into the local papers—Amaneser provides a space for community news, history lessons, book and film reviews, memoirs, short stories, and recipes, many of them sent in by readers from all over the world and edited by the mostly female, mostly volunteer staff. Along with the features and stories, ranging from music to recipes, each issue spotlights a transliteration of the Rashi (Hebrew character alphabet) with a Judeo-Turkish proverb. The example given is No ay koza ke trae yoro al mundo kuanto el vino (“Nothing makes the world cry more than wine”), from a Ladino commentary on the Torah published in the 18th century. The article also covers an excellent interview by Gerson Sarhon with Spanish scholar Paloma Díaz-Mas who specializes in Sephardic culture.